Apple Tree Pruning - On April 1st 2014, Rain or Shine. This is A Beautification Project in Support of the Church of Jesus Christ Latter Day Saint. Address: 1700 West Hovey Ave, Next to Jewel Osco, Bloomington Il. Congratulations on getting your Project Started, Remember Scouts We help Each other to Achieve Great Goals! Eagle Project - NEW REQUIREMENTS!!! The Trail to Eagle culminates with earning (at least) the 21 merit badges required for rank, advancing through all the ranks up to Life, many hours of service to others, successfully holding a variety of Leadership positions, and the completion of an "Eagle Project". More information on this is found in the FAQ area, but this section of the website focuses on the Eagle Project and beyond. NOTE - the BSA just released a NEW Eagle Project Workbook. Applicants must use the LATEST workbook version if they are starting their Eagle Project. 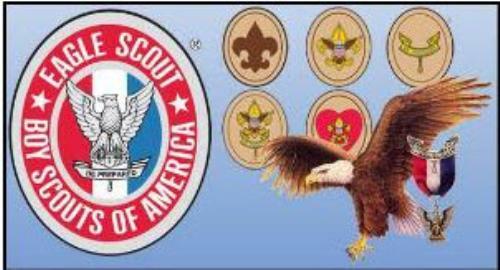 The web link below (and attached file) will provide you with the latest version of the Eagle Scout Workbook. We would be at a loss if we tried to "interpret" a BSA document that is already brilliantly written, but for someone who is merely curious about the process, this page will summarize the Eagle Process. Note that the instructions in the new book do an EXCELLENT job explaining what types of work are acceptable as projects. In short, once a Life Scout decides to start working on his Eagle Project, he should discuss his plans with the Scoutmaster and get direction on selecting a "Project Coach", then he will go through 4 phases to complete his Project. Each phase exists to ensure that Scouts are on-target with Eagle-caliber work and expectations and has a workable plan so that he can be SUCCESSFUL. The proposal is a high level description of the service project to be done. This step ensures the proposed project will meet the criteria for an "Eagle Project". It also ensures that there is a beneficiary who agrees that this project is wanted. A scout should not simply "make up a project" and assume that someone wants the fruit of his labor. Like a job interview, he must seek out the opportunity and get agreements that the project is something the beneficiary desires. THIS IS A CHANGE from the old book. Here, the required signatures are from the Scoutmaster, the Committee Chair, the Beneficiary, and District Advancement. This is a huge change from the prior process. Here, a Scout will list IN DETAIL exactly how he plans to execute this project. It plans the work as he envisions it, as well as lists contingency plans when changes are needed in mid-project. This phase no longer requires signatures, but is still required to be filled out before the work is done. If a Scout intends to raise funds for his project, he must submit a Fundraising Application. This requires signatures from the Beneficiary, the Scoutmaster, and the Council. When the Project is complete, the Scout will record a summary of the project and detail the ways he provided leadership and how (if any) the project scope changed in the course of being completed. It requires the signature of the Beneficiary and the Scoutmaster. Below are just a few excerpts from the latest Workbook. We are posting them there because they echo the message we (unit leaders) have been saying repeatedly to all Eagle candidates, and that is a focus on DEMONSTRATED LEADERSHIP and that the SCOUT be the one who OWNS this work. Leadership demands do not preclude adult involvement, but we strongly caution against "too much guidance" (particularly from parents) who, in their understandable desire to see their son be successful, may overstep the line between providing reasonable "guidance" and assuming "leadership" role. This will put the Troop in the undesired and uncomfortable position of DENYING credit for the project (which IS our right). To avoid any problems, Eagle candidates MUST invite/include ADULT TROOP LEADERS to attend the project IN THE WORKS. We ask this to ensure that those who will be comprising his Eagle Board of Review can say that they have seen the leadership qualities of the candidate and endorse his advancement to Eagle. This troop takes the earning of the Eagle Rank VERY seriously and hold it, and the BSA's legacy & integrity, in very high regard. We trust you join us in this belief and understand why we are asking in advance to help us (and the Scout) AVOID questionable situations. If a boy cannot perform and demonstrate ADEQUATE LEADERSHIP for his project, and show the character traits that embody the Oath and Law, then an honest self-assessment needs to be made to answer the question, "Is he really an 'Eagle'?" The leaders of this troop WILL evaluate these questions and act accordingly to confer or deny the rank of Eagle. but the Scout must be the leader. select, develop, and evaluate your project.